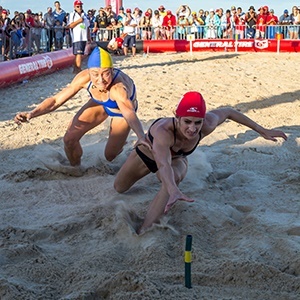 Cape Town - Sport24 profiles two of the women expected to excel at the General Tire Lifesaving South Africa National Club Championships in Port Elizabeth this Sunday, March 24 through to next Sunday, March 31. Carmel Billson finished the South African 2018 season spearheading Marine Surf’s surge to national champions and a week ago she was at the forefront of Marine’s overall victory in the South African OpenWater Championships held in Bloemfontein. Billson ranked first among the female seniors, with sisters Lauren and Natalie completing the family podium placings. Marine’s Teegan Hardwick made it a top four finish for Marine among the best of the female seniors. The strength of Marine at the next weekend’s Nationals will be from their women, be it in the pool or surf. Marine team-mate Sasha-Lee Nordengen Corris was crowned 2018 National Overall Female winner but Billson’s effort in the pool and surf was remarkable in the first year of the pool and surf championships being held in the same week in the same city. Maritz will again be one of the headline acts at the sport’s premier annual competition. She has confidence and form on her side, having shown her class with a silver medal at last year’s World Championship in Adelaide, Australia. Success and awards are part of the Maritz sporting DNA, and in 2017, she was honoured with the prestigious President’s Award for her achievements in the sport and her contribution to lifesaving in South Africa. Lifesaving South Africa president Dylan Tommy said Maritz’s achievements set her apart from most, and that she was a unanimous choice. Maritz, always in the medals at the World Championships, has enjoyed competing at the International Sanyo Bussan Cup in Japan. But her international feats have never diminished her desire to bring her A game to the South African nationals. “It’s the highlight of our season,” said Maritz. “And the atmosphere in Port Elizabeth last year was brilliant. Maritz, typically, isn’t underestimating the challenge of the younger Bianca von Bargen, who beat her at the 2018 KZN championships. Maritz turned the tables at the national championships, winning gold in the sprint and flags. *General Tire is the primary sponsor of Lifesaving South Africa and in 2017 was the first premier corporate to invest in the sport.